There is no doubt that interviews are work for Enya, but she approaches them with stout professionalism. She is not keen to discuss any personal details. She holds eye contact firmly and the tiny blue veins above her pronounced cheekbones seem to become a bit more vivid in her pale skin as she explains that as her working life involves spending from dawn to dusk in the studio perfecting her songs, she is not sure why anybody could be interested in anything else. To the rear of Nicky and Roma Ryan's Killiney home is the building that houses Aigle Studio. The building which is the size of a swollen garage, has a front facade dominated by one large half-moon window extending most of the width of the upper floor. As we come into view of the studio where Enya is to meet us, a black silhouette flits rapidly away from the window. The first "encounter" with Enya was an appropriate one, for Enya is openly uncomfortable with the lack of privacy that has come with success. For her millions of fans, Enya's recordings, with their strange, spacious acoustic sound, seem to offer a respite from a range of everyday pressures, and for the singer herself, it is clear that the need for a certain type of sanctuary is at least as strong. For the moment, that sanctuary is in the wings of the Aigle Studio, located behind a non-descript gateway, off a busy south suburban Dublin road. Enya has, of course, recorded elsewhere, and with other musicians, but in recent years the shy singer has spent all of her working days in this carefully controlled environment. Downstairs in the studio, Nicky Ryan, Enya's manager since she left the group Clannad in 1982, has just finished overseeing the creation of a newly updated recording system. It is now an 88-track monster digital affair, but a quietly elegant monster of which Ryan seems boyishly proud. One element in particular seems to spark his imagination. Displayed on an immense video monitor is an outline drawing of a room, reversed out in white against a black background. By playing with a pad mounted on the control desk, Ryan can pull and push this "room" into a variety of different shapes, shortening the length, or raising the ceiling. With each change he creates an entirely new imaginary, digital chamber into which he can plunge the stream of zeroes and ones in which Enya exists on the studio hard disk. Upstairs is Enya's crisply extravagant white-and-cream salon above the studio. It is here, in her salon, that I first meet Enya. Small, dressed in polychrome-dappled black velvet, the singer sits with the type of upright posture that would undoubtedly thrill a piano teacher. And even more thrilling for any such teacher, or indeed a journalist with a tape recorder, she radiates comfort and an unequivocal eagerness to get to work. There is no doubt that interviews are work for Enya, but she approaches them with stout professionalism. She is not keen to discuss any personal details. She holds eye contact firmly and the tiny blue veins above her pronounced cheekbones seem to become a bit more vivid in her pale skin as she explains that as her working life involves spending from dawn to dusk in the studio perfecting her songs, she is not sure why anybody could be interested in anything else. Some of the 24 million owners of Enya's albums remain - from the evidence of the myriad of Enya World Wide Web pages - hungry for whatever little scraps of biography that have emerged. Foremost among these known details is Enya's membership in one of Ireland's greatest living musical families. If it were not for these good, firm family roots, planted in the Donegal soil, it might indeed be possible to believe that the mysterious velvet-clad singer was simply a figment of somebody's technologically romantic imagination. The family that provides this corroboration are the Brennans from Gweedore, County Donegal. Originally known in her family as "Eithne," Enya changed her name to this unusual anglicization before the release of her first album, The Celts. Eithne Ní Bhraonáin, born in 1961, was the fifth of nine children, several of whom are musicians and all of whom are native Irish speakers. Her father has been in a showband and several of his children followed him into professional music. Eithne studied music at boarding school, and later with a private music teacher. At that stage she had intended to move on to studying music in college, but when invited to tour with Clannad, the band in which five members of her family were already playing, she found herself "jumping at the chance." After two years on the road with the group, musical differences began to come between Enya and her family. "At the time they weren't even writing themselves, it was just arrangements of Irish traditional music. So after two years, I felt I'd done that," said Enya. "I wanted to write and also Nicky Ryan had all of these great ideas about multi-layered vocals and I found his ideas quite fascinating, but the group just wasn't interested." At the beginning, work came in the shape of film soundtracks, first for The Frog Prince and later for the BBC television series, The Celts. Originally, the BBC only sought one track from Enya, but they were so impressed with the singer's work and the way it communicated the ideas of the show, that they soon commissioned the entire soundtrack from her. The album, with its mysterious, floating vocal sound - for which the singer gives Ryan, a Phil Spector and Beach Boys fan, credit for inventing - set out a style and a mood that has been the basis of all her subsequent work. One Irish musicologist has suggested that this feel originates in using chords with interval tones that are highly characteristic of Irish traditional music. But for most fans, Enya's music is about a certain atmosphere. This atmosphere is, in part, generated by a sense of time so that it is difficult to imagine it not being linked to the singer's uniquely slow and methodical working methods. Typically, Enya will, she explains, develop a melody over many months, layering Roma's lyrics with instrumentation in a manner that almost seems closer to freeform weaving than music making. Playing and singing by herself, she builds up these layers of sound until the correct atmosphere emerges. A song that takes up three or four minutes on an album might represent hours of singing and live playing from Enya. For even if her studio possesses leading-edge digital technology, all of the singer's vocals are live. "We don't sample," says Ryan with undisguised pride. Even after a track has reached the finish stage, Enya is reluctant to abandon it. She will instead set it aside for some more time, coming back later to see how it should be adjusted. "I think it is a good way to judge one's work, to leave it aside, whatever it may be. Writing a book, or writing a melody, when you are working on a project, it is very difficult to assess if you are happy with it, if this is what you are looking for..."
With a working method like this, it is hardly surprising that Enya's output remains low. Although she does admit that "as soon as I have finished an album, I just cannot imagine going to work on another one." She also says that the long gaps are not really part of a plan. "We didn't plan that there would be such a gap between Shepherd Moons and The Memory of Trees. Toward the end of The Memory of Trees I really felt quite anxious, because there had been quite a gap and I didn't know what to expect. Because of the way I work, each time is kind of like your first album. But I think that is good for the work because you're able to concentrate on the album without having distractions. Putting a date on it would be dangerous for me." In the same way Enya likes to draw very bold lines between her private and public life, she is also keen to keep the time she spends on her music quite separate from the rest of her time. "I am not thinking of music at all when I have my free time. I don't keep jotting down ideas, because I believe that if an idea or a melody is good enough, you'll be able to find it when you're working. I know that some wonderful moving moments - it could be a landscape, a beautiful walk I had one day - all seem to come into the studio with me. When I play the melody, or sing the melody, I go into that moment and I know when I listen back where it's right and where it's wrong." Enya's eccentric production schedule (even when she is at work, she says, she could be "a week or a month without completing any melody") has meant that she has released three albums in eight years. However, breaking with the traditional rock treadmill of touring and recording has not, evidently, harmed her ability to sell large numbers of compact discs. Because Enya's music is so studio-bound, touring has been impossible. This may, however, change, according to Nicky Ryan. So far, Enya has played all the instruments on her records, but Ryan would not rule out using an orchestra to create a backdrop for Enya, something that might eventually allow her to play live. Already, Ryan mentions in passing, she has declined an offer of nearly 500,000 pounds sterling to play one concert in Japan. For the moment, after an extended break including "a lot of time" spent in Paris (there are unconfirmed rumors of a "long-distance relationship" with its roots there), the idea of getting back to work is finally beginning to appeal to the singer again: "Next month I'll be going into the studio to write. It's nice to want to go into the studio rather than to have to go into the studio." 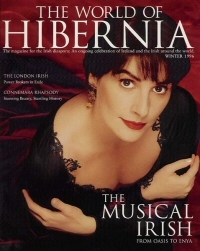 Note: Enya was one of a dozen or more Irish musical artists featured in this issue of World of Hibernia. The magazine ceased publication in 2002 or 2003, but copies of this issue surface occasionally on eBay and well worth grabbing. The photo quality is outstanding. The article was originally transcribed by Robert Celic.